This lesson is part of a unit focusing on the Underground Railroad and the Civil War. Students will examine primary and secondary sources to get a better understanding of the issues and events that occurred during this time period. This lesson focuses on Wisconsin's role in the Underground Railroad, as well as some of the important national historical figures of this era. View the original source document: WHI 73952. 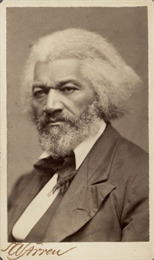 The primary sources used in this lesson, all of which can be found in the book "Letters of a Nation," include the following: a letter written by Frederick Douglas to Harriet Tubman, thanking her for her efforts in the abolitionist movement; a letter written by the escaped slave Spotswood Rice, to his former master's wife explaining to her why she will "burn in hell"; and a letter written by John Brown to his pastor four days before he is to be executed for his role at Harper's Ferry. In addition to these letters, many secondary sources, all found in the book Freedom Train North, describe the stories of fugitive slaves who used the Wisconsin Underground to escape to freedom. Divide the class into four groups. Give the first three groups copies of one of each of the letters. Provide one of the stories from Freedom Train North or another secondary source, to the fourth group. Ask students in the letter groups to answer the following questions: who wrote the letter, who received the letter, what is it about, and why was it written? Ask students reading the secondary source to answer the following questions: who is the story about, where did it occur, what is it about, and what role did Wisconsin play in this event? Have each group present their answers to the rest of the class, with the secondary source group reporting last. Ask the entire class to examine a map and explain why Wisconsin could play a role in the Underground Railroad. Possible answers would include Wisconsin's proximity to Canada and Lake Michigan, the state's immigrant populations had no tradition of slavery, immigrant German 48ers were revolutionaries who fought for freedom). Using either Freedom Train North or another secondary source, read to the class another true story involving the Wisconsin Underground Railroad. Using library resources, have each student research and write a brief biography on Frederick Douglas, Harriet Tubman, or John Brown. Have students conduct research to find more primary documents dealing with the Underground Railroad. Carroll, Andrew, ed. Letters of a Nation. New York: NY. Kodansha International, 1997. Pferdehirt, Julia. Freedom Train North: Stories of the Underground Railroad in Wisconsin. Middleton: WI. Living History Press, 1998. This teacher-submitted, elementary-level lesson plan appeared in Badger History Bulletin. Please adapt it to fit your students' needs. Author: Zachary Gajewski, University of Wisconsin-Stevens Point.